Trump should champion a 10-year, $1 trillion program, with much of the money raised by cities and states using Build America Bonds. In the most divisive presidential election in memory, there was perhaps one thing every American could agree upon: The whole damn country is falling apart. Physically, that is, with most bridges in decay, transit systems unable to cope with growing ridership, and roadways with potholes that blow out tires, snarl traffic, and cause productivity-killing delays. And it has become a cliché to describe U.S. airports as “third world,” as Vice President Joe Biden dubbed New York’s wretched LaGuardia Airport, even though facilities in most emerging countries put America’s outmoded and inconvenient airports to shame. 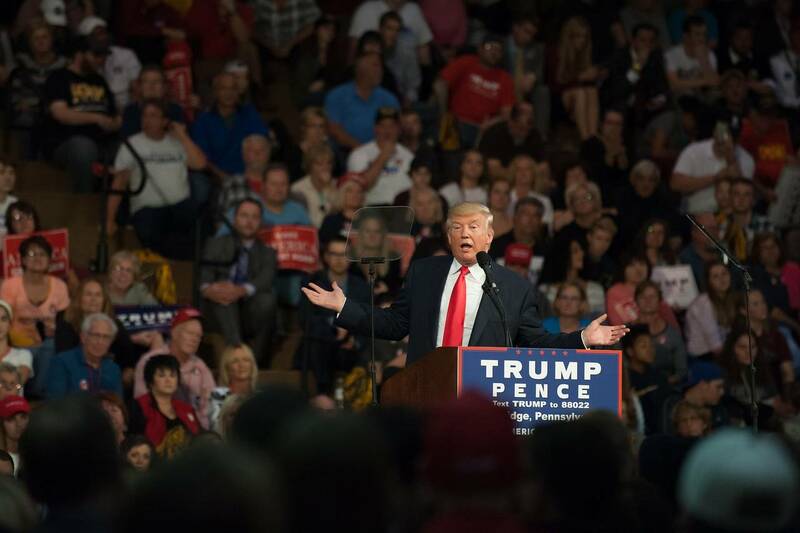 To that end, both the campaigns of President-elect Donald J. Trump and his opponent, Hillary Clinton, contained platform planks for major infrastructure expenditures. So, if we’re all in agreement, what’s preventing the bulldozers and cranes from getting to work? If it were that easy, it would already have been done. First, there’s the task of planning and approving projects. Remember all the “shovel ready” jobs that were supposed to be done as part of the Obama administration’s stimulus package? 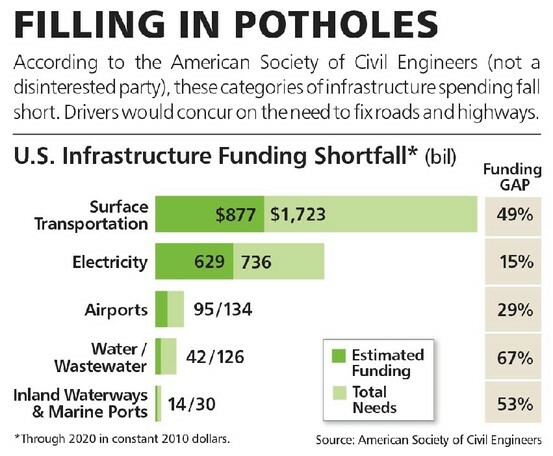 Only a tiny fraction of the $800 billion in the program wound up for infrastructure. 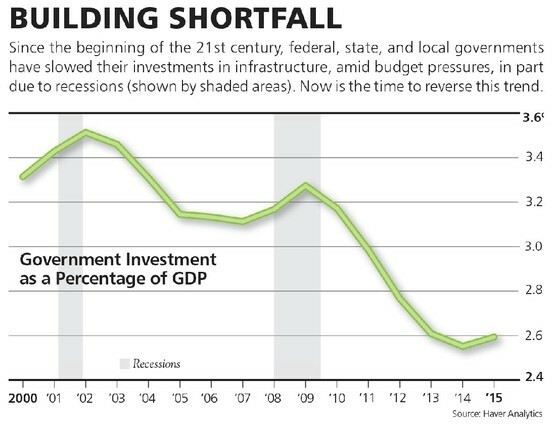 But after two wars and the worst recession since the Great Depression, federal debt has soared to nearly $19 trillion, leaving far less flexibility for the U.S. to fund infrastructure projects. That doesn’t mean it shouldn’t be undertaken. The cost may be staggering, but failing to invest in needed infrastructure would be more expensive in the long run, given the toll in terms of productivity and, in some cases, lives. 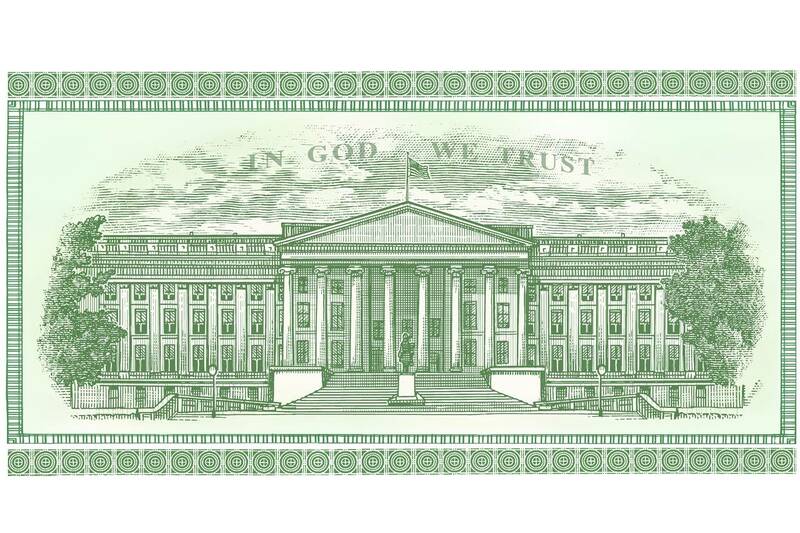 Moreover, we have a unique chance to pay for investments in infrastructure cheaply with historically low interest rates, including the possibility of issuing 100-year bonds, as discussed here in a cover story two weeks ago (“Taming the Federal Debt: The Case for 100-Year Bonds,” Nov. 19). As the uptick in bond yields in recent weeks suggests, we may not have this opportunity forever. Adding to the federal debt is the main sticking point for deficit hawks. 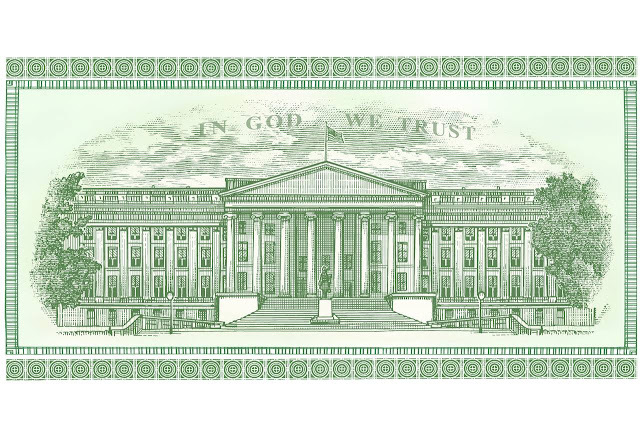 But there are other ways of financing infrastructure besides simply issuing Treasury bonds. Two of Trump’s key advisors, Wilbur Ross, his pick for Commerce secretary, and economist Peter Navarro, propose a “totally self-financing plan” using up to $137 billion in tax credits to fund up to $1 trillion of projects. Clinton also had proposed a so-called infrastructure bank, which Steven Mnuchin, Trump’s choice for Treasury secretary, has endorsed. 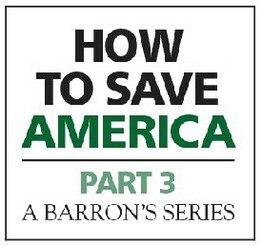 Barron’s offers another option to pay for these much-needed projects: a revival of Build America Bonds, a short-lived program that provided for taxable municipal bonds with a federal subsidy in place of the tax-exempt status of most municipal bonds. BABs were part of the Obama administrations’s 2009 American Recovery and Reinvestment Act, but the program expired at the end of 2010 and wasn’t renewed. Build America Bonds wouldn’t add directly to Uncle Sam’s debt load and would be a more efficient way to finance much-needed infrastructure programs than traditional tax-exempt municipals. And unlike a big infrastructure-spending scheme, BABs could be added as part of tax-reform legislation, which has become a top priority for the incoming Trump administration. Then states, cities, and public authorities can draw up their own plans to shore up roads, bridges, and waterways without Washington. WHAT USED TO BE CALLED public works didn’t always get short shrift. From the building of the Erie Canal to public-power projects to the nation’s roads and bridges, these projects have been integral to the market-based economy. 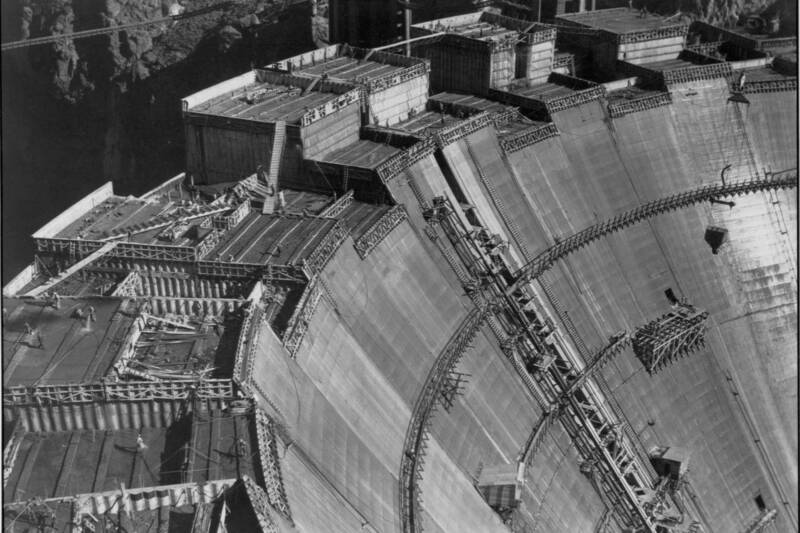 And while they’re identified with Democrats and the New Deal, Republican presidents’ names are associated with projects such as Hoover Dam and the Eisenhower Interstate Highway System. 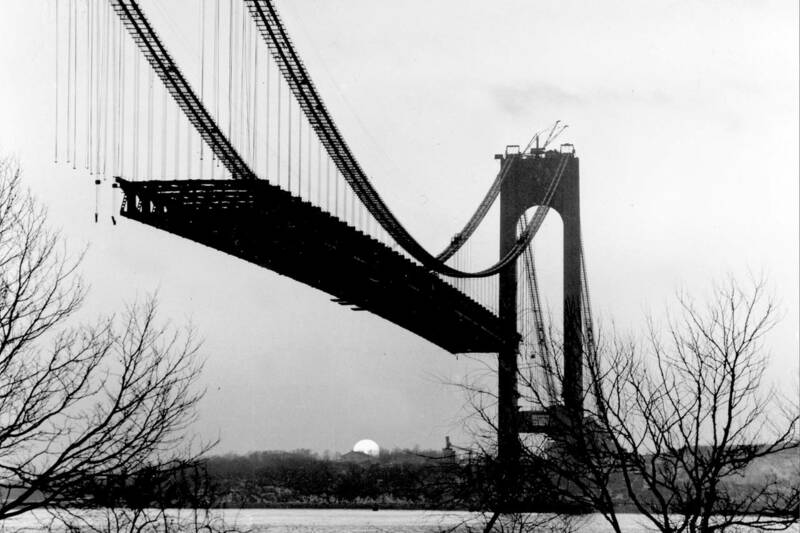 Perhaps the public perception of big infrastructure projects was soured by the legacy of Robert Moses, the so-called master builder of the New York metropolitan area from the 1920s all the way through the 1960s. Though holding no elected office, Moses was able to construct much of the roadways, bridges, and recreational areas in and around the Big Apple. But he gave short shrift to mass transit, and critics contend he destroyed whole neighborhoods, mostly minority, to fulfill his grand building schemes. Moses’ legacy, good and bad, persists to this day. Yet there is no way around the decrepit condition of the city’s infrastructure. 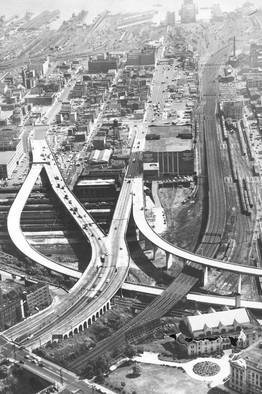 Past years of neglect were exemplified when a section of the elevated West Side Highway came crashing down during the Big Apple’s fiscal crisis of the 1970s. That’s the result of the decline in public investment as a percentage of gross domestic product in this century, traced in the chart here. The shortfalls are especially acute for surface transportation. Even so, there remains resistance to spending government money to bring infrastructure up to snuff. Opponents conjure up pork-barrel schemes such as “bridges to nowhere.” Japan has spent much of its two lost decades spending trillions of yen on gleaming new projects but has produced little in the way of economic growth. Chris Senyek, chief investment strategist at Wolfe Research, estimates that the Obama stimulus plan yielded less than $50 billion of “shovel ready” projects. In the U.S., projects that once took a year or two now require more than a generation. An inside joke for New Yorkers in the cable-TV series Mad Men, set in the 1960s, was that the Second Avenue subway was due to open soon. Its long-delayed opening is supposed to take place by year end. By contrast, the original New York City subway system was completed in less than five years, shortly after the turn of the 20th century. Similarly, many of the shovel-ready projects were bottled up in the federal bureaucracy, observes Greg Valliere, longtime Washington watcher and chief strategist at Horizon Investments. And Republicans seem lukewarm about infrastructure investment, given their aversion to big, new federal spending programs. BUT THE COST OF NOT PROCEEDING is even greater. Economist Laurence Kotlikoff, one of the leading experts in the total debt burden of the U.S. government, estimates that all federal obligations—bonded debt plus unfunded Medicare and Social Security costs—total $199 trillion, an astounding 11 times the national debt conventionally measured. Kotlikoff ran for president this year as a write-in candidate on a platform to avert such a fiscal disaster late in this century. Yet he decried inadequate infrastructure investment as a threat to public safety as well as a burden on the economy. This fiscal hawk says the investment should be done without printing money or borrowing. Other economists suggest infrastructure could be self-financing or that the economic payback would make borrowing worth it. In a recent report, Goldman SachsGS in Your Value Your Change Short position economist Daan Struyven notes that estimates of the short-term multiplier effect from infrastructure spending are higher (1.4 times) than other government spending (1.2 times), tax cuts for upper-income earners (0.4 times) and for businesses (0.2 times). As for where the spending should be targeted, Olivier Blanchard, former chief economist for the International Monetary Fund, writing for the deficit-averse Peterson Institute for International Economics, argues, “Maintenance of existing infrastructure, for example, which has been badly neglected, may be less glamorous and less politically attractive than brand-new projects, but it is where the government is likely to get the best bang for its buck.” Maintenance and useful public projects also may have higher “social returns” but lower financial returns than those funded by public-private partnerships, he adds. AS IMPERATIVE AS IT IS TO FIX ROADS, highways, bridges, mass transit, and waterways is the question of how to pay for them all. The Trump program is forecast to raise the federal deficit to 7% of gross domestic product over the next 10 years, according to analyses by the Tax Policy Center, the Tax Foundation, and Moody’s Analytics, writes Stephen S. Roach, former chairman of Morgan Stanley Asia and the firm’s chief economist, and a senior fellow and lecturer at Yale University. Roach dismisses as supply-side “creative accounting” contentions by Trump advisors Ross and Navarro that a sharp narrowing of the trade deficit will produce a surge in GDP and revenue. That said, infrastructure investment will pay off more than any other fiscal measures, according to estimates cited by Goldman Sachs. The return should come in greater productivity for the economy as impediments from crumbling infrastructure are reduced. After all, it’s hard to see how self-driving Teslas could cope with the crater-size potholes common in urban thoroughfares. Valliere sees Democrats, led by New York Sen. Chuck Schumer, as being more enthusiastic about infrastructure spending than the GOP, especially the deficit hawks. The Ross-Navarro plan of up to $137 billion in tax credits to induce private companies to undertake $1 trillion in infrastructure would supposedly pay for itself out of the taxes paid by workers and companies on the projects. Sounds good, except those self-funding public-private partnerships might not repair the bridges or the waterways needed to move barges of freight. Those are places for traditional public-sector financing, which is arguably better suited to states, cities, and public agencies. But their traditional mode of financing—tax-exempt municipal bonds—isn’t the ideal method for upward of $1 trillion worth of projects. Quite simply, tax-free bonds appeal only to investors who pay taxes, such as wealthy Americans with taxable accounts, but not those who don’t, such as those with retirement accounts or pension plans, or non-U.S. investors. THAT’S WHERE BUILD AMERICA BONDS come in. Rather than the backdoor federal subsidy for regular munis (by way of the lower yields from the tax-exempt status for their interest), the federal government paid 35% of the interest on BABs, equal to the corporate-tax rate. Thus, the direct federal subsidy made up for the higher yield versus a tax-free muni. Indeed, a Treasury study found that BABs saved issuers an average of 0.84 percentage point on 30-year bonds compared with traditional tax-free munis. A revived Build America Bond program ought to come with a smaller federal subsidy equal to the lower corporate tax rate the Trump plan envisions, 15%, or the 22% rate Barron’s proposed in a cover story on Nov. 26 (“Cut the Top U.S. Corporate Tax Rate to 22%”). That still would be attractive to state and local issuers, who have to pay tax-free yields close to what fully taxable long-term bonds yield. Equally importantly, BABs wouldn’t add to the burgeoning federal debt as would Treasury borrowing. State and local authorities could choose the infrastructure projects to be funded by bonds, which would either be paid for by revenues such as tolls, or by taxes approved by their state and local representatives, instead of by Washington. To make America great again, you have to fix its crumbling infrastructure. And make no mistake, that will be expensive. Uncle Sam will probably have to shoulder part of the burden along with private projects backed by tax credits, as has been discussed. But Build America Bonds can help rebuild the U.S. without adding to the excessive federal debt. Just as Ronald Reagan’s landmark 1986 bipartisan tax reform increased simplicity, fairness and economic efficiency by broadening the tax base and reducing rates, today reform of the system has the potential to help American families and the economy. Properly designed, revenue-neutral reforms could help to offset the dramatic increases in inequality that have taken place over a generation, repair a business tax system that globalisation has rendered dysfunctional, reduce uncertainty and promote growth. Unfortunately, what we know of the intentions of the president-elect and congressional leadership suggest that they risk pushing through the most misguided set of tax changes in US history. The proposals from the presidential campaign, reiterated last week by President-elect Donald Trump’s choice for Treasury secretary, will massively favour the top 1 per cent of income earners, threaten an explosive rise in federal debt, complicate the tax code and do little if anything to spur growth. A core principle agreed to by all in 1986 was that reform would not reduce the tax burden on high-income taxpayers. Reagan achieved this objective while reducing top marginal rates because he raised capital gains rates, scaled back investment incentives, increased corporate tax collection, curtailed shelters and left estate and gift taxes alone. Unfortunately, neither the Trump plan, nor the one put forward by Paul Ryan, speaker of the House of Representatives, provides for nearly enough base-broadening to finance all the high-end tax cutting they include. Steven Mnuchin, Treasury secretary-designate, asserts there will be no absolute tax cut for the upper class because deductions would be scaled back. The rub is that totally eliminating all deductions for those with incomes over $1m would not even raise enough revenue to cover reducing their marginal tax rates from 39 to 33 per cent, let alone offset their benefit from huge rate reductions on business and corporate income, and the elimination of estate and gift taxes. Estimates of the Trump plan suggest that it will raise the average after-tax income of the 0.9 per cent of the population with incomes over $1m by 14 per cent, or more than $215,000. This contrasts with proposed tax cuts for those in the middle of the income distribution of $1,000, or about 2 per cent. 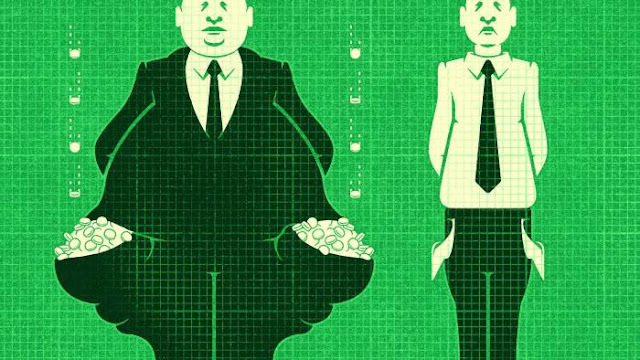 The repeal of estate and gift taxes is especially problematic because it would provide a window for the very rich to use gift and trust structures to ensure that their wealth passes without tax not just to their children but to their grandchildren and great grandchildren, regardless of subsequent legislation. The Reagan tax reform simplified the code by eliminating the need for rules distinguishing ordinary and capital gains income, because these were taxed at the same rate, and by doing away with industry-specific shelter provisions. In contrast, the Trump proposal creates sheltering opportunities by reducing to 15 per cent the tax rate on any income that can be characterised as coming from an incorporated entity. Rather than reducing targeted subsidies, it would establish a highly dubious 82 per cent credit — the highest in the world — for financial equity investments in infrastructure. This would mean not only disproportionate tax reductions for the upper-income group that has seen its incomes rise most rapidly over the past generation. It would also mean grave damage to federal budget projections. The envisioned Trump tax cut is about the same size relative to the economy as the 1981 Reagan tax cut. It is worth remembering that Reagan, hardly a fan of reversing course or raising taxes, found it necessary to propose significant tax increases in 1982 and 1984 (the equivalent in today’s economy of $3.5tn over a decade) due to concerns about federal debt. Today’s budget situation is much more worrisome. The baseline involves much higher levels of debt and deficits. Then the economy was suffering from a deep recession; now it approaches full employment. If extreme tax cuts are legislated in the next months, uncertainty about the federal budget and about further tax adjustments is likely to rise. Finally, I can find no basis in either economic history or logic for Mr Mnuchin’s claim that the proposed reforms would increase the economy’s growth rate from its current 2 per cent rate to the historical 3 to 4 per cent norm. Adult population growth has slowed by nearly a percentage point, the gains generated by more women entering the workforce have been exhausted, and it is far from clear why tax reform will hugely spur productivity growth. Indeed, because the Trump proposal would redistribute after-tax income towards those most likely to save it, push up long-term interest rates because of debt pressures, increase uncertainty and the advantages of overseas production, it is as likely to retard growth as to accelerate it. In the 1980s, Don Regan, Treasury secretary, said the first Reagan reform proposal was written on a word processor to signal the administration’s openness to negotiation and radical alteration. We should all hope the Trump administration follows Reagan’s approach on both tax policy principles and a commitment to bipartisan negotiation. Dec. 11 marks the 15th anniversary of China's accession to the World Trade Organization. Measured by its impact on the Chinese economy, which has grown almost tenfold since 2001, accession to the WTO was no less momentous than the epochal changes ushered in by the start of "Reform and Opening" in 1978 or the fiscal and political recentralization that followed the 1989 Tiananmen crisis. In the scale and speed of changes it wrought on Chinese society and politics, WTO accession was hardly less revolutionary than the Great Leap Forward of 1958-1961 or the Great Proletarian Cultural Revolution of 1966-1976. And in terms of their import for the structure of the global economy, few events in recent memory equal China's entry into the organization. By virtually any indicator, Dec. 11, 2001, was an inflection point not only for China's economy but also for much of the world's. But the anniversary also highlights how Chinese integration into the global economy remains incomplete. On Sunday, a key provision contained in Article 15 of China's WTO accession protocols will expire. At issue is what countries must do to make the case that China is subsidizing exports as a way to undercut competition abroad. The provision stipulates that unless producers in China can "clearly show that market conditions prevail" in a given sector, WTO members importing Chinese goods from that sector can use a different methodology for assessing whether to impose anti-dumping measures. Rather than compare Chinese domestic and export prices for a good (the standard procedure for market economies), the provision allows WTO members to compare Chinese prices with rates for the same good in countries with similar levels of development. In practice, this provision makes it much easier to launch anti-dumping investigations in the WTO and to impose protective tariffs on Chinese imports than if China were recognized as a market economy. The expiration of the provision will leave open the question of how WTO members should now assess under what conditions to impose anti-dumping measures against China. For Beijing, the answer is clear: Because the provision is the only mention in the accession protocols of a procedure for judging Chinese trade practices differently than those of market economies, its expiration should make China, by default, a market economy. Therefore, Beijing argues, WTO members must treat China the same as they would other market economies: by comparing Chinese domestic and export prices. For key industrial goods such as steel, which China produces far more than it consumes and thus exports in large volumes and at low prices, this would make it much more difficult for countries to impose anti-dumping measures on China, at least by WTO regulations. After all, though Chinese steel exporters may undercut their U.S. and European competitors, the prices are not systematically or artificially lower than what they charge at home. But while the accession protocols nowhere clarify that on Sunday China will not automatically be granted market economy status, neither do they state that other WTO members will be required to regard it as such. And therein lies the rub. Not all WTO members agree with Beijing. The United States and Japan, driven both by domestic protectionism and a rising sense of strategic competition with China, have indicated that they do not yet regard China as a market economy and thus will not use market economy-based measures to judge China's dumping practices. It is unclear whether other major WTO players such as Canada, India and Mexico will follow suit. Against this backdrop, the question of whether the European Union will grant China market economy status has drawn considerable attention. Initially, an EU decision on China's status was expected by midyear. And with the strong backing of the United Kingdom and the modest support of Germany, the prospects of an affirmative vote looked promising. Brexit upended both expectations. The United Kingdom, which has heavily courted Chinese investment in recent years, was perhaps the strongest EU proponent for granting China market economy status. But with London's negotiating power now substantially diluted, the calls of countries strongly opposed to rendering China a market economy — and thus to loosening controls on imports of Chinese industrial goods — will undoubtedly grow louder. Italy, home to a long-struggling steel sector, leads the opposition, followed by Spain and much of Southern Europe. Germany, with advanced steel and industrial sectors that are less vulnerable to cheap Chinese imports, is unlikely to actively block an affirmative decision. But whether it has the will or interest to actively champion China's market economy claim at a time of rising protectionism at home, across Europe and globally is another matter. Whatever Europe's decision regarding the extent of China's market orientation, the expiration of the provision will likely require some reformulation of EU laws regarding Chinese dumping practices. China has threatened to take its case to the WTO for arbitration. In the meantime, Beijing will do what it can to secure an at least partial relaxation of existing tariffs on European imports of China steel and other industrial goods. This endeavor is becoming more urgent given U.S. President-elect Donald Trump's pledge to ramp up U.S. duties on imports of Chinese goods, particularly steel. Though Beijing will continue its long-running efforts to consolidate its steel and other heavy and construction-related industries in 2017, its overriding imperative to maintain stable economic growth — all the more pointed in light of President Xi Jinping's push to consolidate his power ahead of the 2017 Party Congress — means those efforts will likely bear only limited fruit next year. Measured in terms of gross domestic product, trade, energy consumption and any number of other economic indicators, WTO accession revolutionized the Chinese economy. But the very fact that Beijing and its WTO counterparts are still haggling over the meaning of Article 15 points to the incompleteness of that revolution. In all likelihood, the provision's vagueness on the matter of China's status reflects the fact that in 2001, neither China's leaders nor those of other WTO members imagined that come Sunday China would not be, clearly and for all to see, a market-driven economy. One need look no further than its state-dominated financial system to see how China has fallen short. Former Chinese Premier Zhu Rongji, who drove China's arduous WTO accession process, envisioned membership as a means to force his country out of its cycles of inwardness and irreversibly into the world. In some ways, his vision was quickly realized. In others, it remains a dream deferred. It’s been just shy of a month since our last “post-election” market update and given the recent developments across markets, it seems a pertinent time for an update regarding our thoughts on the precious metals market. · The gold miners have held up much better and have held support, for now. This kind of “bullish divergence” often hints at price action to come (bullish). · We believe the key forces influencing gold are a) real yields and b) the dollar, both of which broke out topside (bearish) following Trump's victory. · In the very near term, real yields as measured by 5 year TIPS, have rolled over following the Trump rally, whilst the dollar continues to move higher. This sets up a possible “tug of war” on the gold price. · Overall, there is a mix of bullish and bearish indicators in the gold space, making near term predictions difficult. · The Fed rate decision to hike just came out - we're likely to see big swings directly post announcement. 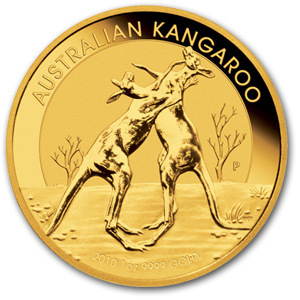 · For those looking to hedge their gold portfolio, the best bet right now looks to be in the currency markets, with a short on key dollar constituents. For those after some more detailed reading, see below for a more detailed analysis of the current setup. Contrary to the pre-election consensus, Trump's victory has been negative for gold, at least in the short term. Since his election on November the 8th, price has declined from a peak of $1,336 to where it’s currently trading at $1,170 – a drop of $166 or 12.5%. In my previous update I noted that we needed to be very cautious of a downside break of $1,200. Given that this breakdown occurred, I believe investors should take a cautious approach regarding the near term direction in the gold price, as momentum is firmly to the downside at present. The miners are currently trading at the same level as they were when gold was $50 higher at the $1,220 level - this is what technicians (chartists) refer to as “bullish divergence” and this can be (but is not always) a leading indicator regarding the price action to come in the near future. In order to confirm this signal, we need to see a reversal of the downtrend in the gold price, with a break above $1,200 (hopefully with “gusto”) combined with a breakout upwards out of this sideways consolidation pattern we’re experiencing in the miners. This would be seen as a breakout above 22 in the GDX, with an eye to breaking the mid-term downtrend (i.e. the 22 to 23 level). Until we see this kind of confirmation, from a technical standpoint one should remain aware of the possibility that miners may “capitulate” downwards and “catch up” with gold. In my opinion, there are two key drivers of the gold price right now, both of which have “broken out” post-election; 1) real yields and 2) the strength of the U.S. dollar. Real yields are best measured using 5 year TIPS, or Treasury Inflation Protected Securities. Presently, the TIPS yield has the strongest (inverse) correlation to gold of any asset class that I’m aware of. This makes sense given golds primary “competition” as a safe haven store of value is US treasuries, the relative attractiveness of which varies depending on the degree to which inflation destroys it’s yield (it’s main perceived advantage over gold). The breakout in the real yields contributed to the smack down in gold through the key support level of $1,250 and it’s continued rise has been a big bearish headwind for the gold price. However, in the very near term (the past 2 weeks), TIPS yields have started to roll over, with no sign of support kicking in, yet (see chart below). If TIPS yields continue to correct, this should provide a positive backdrop for gold to move higher. The opposite is also true and if we see a strong support into a bounce, then this would likely add to further downward pressure in the gold space. The reasons for the breakout are many, and deserve a discussion all on its own, but needless to say there are plenty of macro reasons to suggest the dollar may trend higher for some time. With uncertainty in the precious metals markets, it may be a good time to consider hedging a gold portfolio against further downside that may eventuate. Whilst we can’t discuss specifics here, with the dollar looking strong, some see the best bet being the currency market, i.e. shorting the major constituents of the Dollar index. To sum things up, there are a host of conflicting forces acting on the gold market right now, making forward looking predictions extremely difficult. On the one hand, momentum in the gold price itself is firmly to the downside and we’ve yet to see any buying support during this selloff that followed Trump’s election. However, gold remains extremely oversold and mining stocks (often forward looking) have diverged in a bullish manner, giving hints that we may be nearing a bottom in this correction. In order for that signal to be confirmed, we need to see a convincing break for gold above $1,200, and a move above 22 to 23 in the GDX. As far as the factors driving gold are concerned, we are again seeing conflicting patterns. Both real yields and the dollar both broke out to the upside following Trump’s election, a negative “double whammy” for the gold price. However, since breaking out, TIPS yields (arguably the most important influence) have looked weak in the very short term (bullish for gold). If these continue to move down, this should provide strong bullish tailwinds for the gold price. On the flip side, the DXY has looked much stronger, correcting only slightly before rebounding over the past few days. Whilst we think real yields are likely to impact gold the most over the mid to long term, a rising dollar would likely provide negative headwinds for the gold price. If real yields and the dollar continue to move in opposite directions, we are likely to see a fascinating case of “tug of war” on the gold price. With the Fed rate decision to hike today, Wednesday (14th of December) – we are likely to see some big swings in price immediately following this decision, and the price direction in the immediate aftermath. Price action following the decision may confirm the short to mid-term direction. PARIS — For Europe, 2016 has brought a series of political shocks: near-record numbers of immigrants arriving from the Middle East and Africa; a vote by Britain to leave the European Union and renewed threats by Russia to meddle on the continent. But 2017 could be even bumpier. There will be at least three elections in Europe next year: in Germany, France and the Netherlands for sure, and now perhaps in Italy, too. Just about everywhere, political establishments are being blamed for tepid growth, for too few jobs and for favoring global financial markets over the common citizen. The latest indicator of popular discontent was Italy’s referendum on Sunday, when voters rejected constitutional changes proposed by Prime Minister Matteo Renzi. That result was a stinging blow to Mr. Renzi, who said he would resign. Coming after Britain’s vote this year to leave the European Union, the Italian outcome was taken as yet another rebuke to decades of efforts to forge a closer union of the bloc’s 28 countries. And it raised new doubts about whether that union would hold in the years ahead. “This is a crisis that strikes at the absolute core of the European Union in a way even ‘Brexit’ does not,” said Mujtaba Rahman, the managing director for Europe at the Eurasia Group, a risk consultancy. The Italian electorate rejected a constitutional overhaul that, among other changes, would have increased the power of the prime minister by reducing the number of senators and decreasing their power. The political impact of the rejection lies less in any direct effect on policies than in the opening it provides for the populist Five Star movement, which campaigned against the constitutional changes. It also brought the resignation of Mr. Renzi, a strong supporter of the European Union who was working hard to stabilize some of Italy’s shakiest banks. That is especially so with yes-or-no referendums — first in Britain, now in Italy — where a populist rejection of the political establishment can, by extension, also be a chance to send a message to the unelected officials in Brussels who work closely with European government leaders. In that context, Mr. Heisbourg said, the anti-European Union sentiment “is just a handle for the sense of a loss of control, a loss of agency” that people feel. 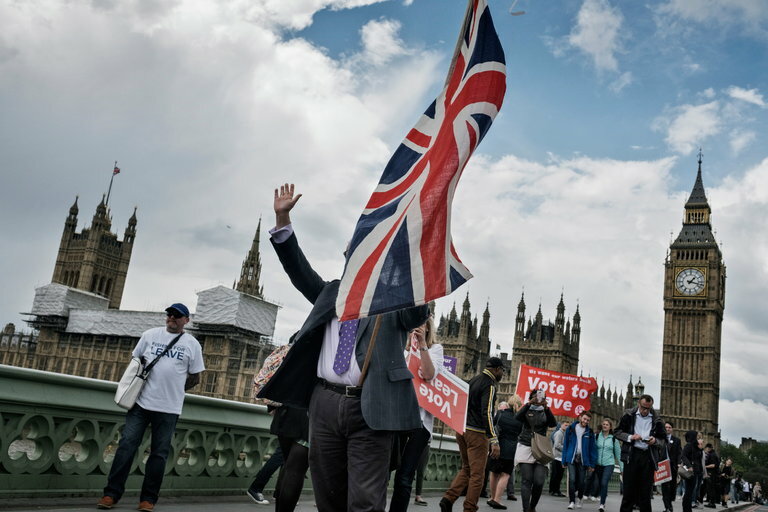 The motivation for voters in Britain and Italy was much the same as that for American voters who backed Donald J. Trump: to drive home to the elite that the status quo was unacceptable. Compounding the frustration on both continents, and especially in Europe, are the lingering effects of the global recession of 2008, from which many European countries never fully recovered. “The social contract that we, the West, signed up to — Europe, the United States — no longer adds up,” for people, said Xenia Wickett, who oversees the United States and the Americas program for the research institution Chatham House. In France, for example, economic growth barely reached 1 percent last year. Youth unemployment there still hovers near 25 percent. (In Italy, Spain and Greece, it is even higher.) Older and less educated workers feel overwhelmed by an economy that seems to have left them behind. “The Rust Belt isn’t just in America — there’s a Rust Belt in the north of France,” said Alexandra de Hoop Scheffer, the director of the Paris office of the German Marshall Fund. Far from easing those anxieties, membership in the European Union is blamed for exacerbating them. 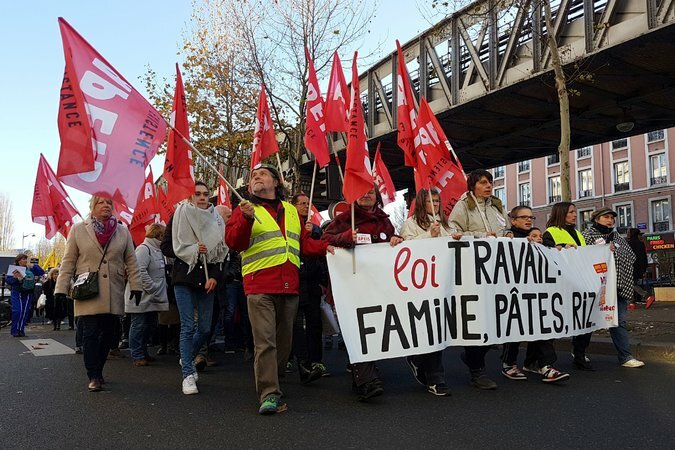 And the austerity regime that Brussels officials and international lenders have demanded, especially across southern Europe, has fueled anger still more. The Italian vote will probably widen the gulf between the northern eurozone countries, led by Germany, and those in the south, said Pawel Tokarski, a senior researcher at the German Institute for International and Security Affairs in Berlin. Many in Germany and other northern countries, he said, will take the vote as a sign of unwillingness in Italy to overhaul its economy the way Brussels wants. “Definitely, this vote is going to strengthen the anti-E.U. voices,” Mr. Tokarski said. Those voices have been building for more than 25 years, as the union expanded, the Brussels bureaucracy grew and many people began to feel that the union’s regulations and requirements were more trouble than they were worth. Tensions were apparent as early as 1992, when the Maastricht treaty, which was meant to bring Europe closer together, barely won approval in Denmark and France. Today, anti-European Union positions are part of the platform of almost every populist party, including Marine Le Pen’s National Front in France; Geert Wilders’s Party for Freedom in the Netherlands; and the Five Star Movement in Italy, led by Beppe Grillo. The political demise of Mr. Renzi, the Italian prime minister, and his reform agenda removes an unabashedly pro-European leader who had hoped to ignite economic growth by ending an era of crippling budget austerity. Instead, he may be remembered for creating an opening for politicians who are openly hostile to Europe and the euro. The old center-right and center-left parties that divided power in a number of countries and kept Europe stable for decades are being swept aside by new and unpredictable forces nearly across the board. Politicians who play on nationalism and worries about economic disenfranchisement are on the rise. Animosity toward the European Union is of a piece with this feeling. “Right versus left doesn’t exist any more,” Mr. Wilders, who is regularly rated as the most popular politician in the Netherlands, said in an interview. Many voters on both sides of the Atlantic seem fed up with the old political names and faces, like Hillary Clinton or Jeb Bush in the United States. In France, the list includes the former president Nicolas Sarkozy and another center-right figure, Alain Juppé, who are both out of the 2017 presidential race, as well as the current Socialist president, François Hollande, who decided not to seek a second term because his approval ratings were so poor. With so many major elections on the way and so few of the big questions settled, Europe seems destined to continue to be subject to political tremors — and vulnerable to stronger forces that risk fracturing the European Union altogether. “What we want is to bring back the values, the identity, the culture and the money, and put forward again national interests,” Mr. Wilders said. Whether such changes are possible is hard to know, but Europe’s populists would clearly like to project an air of inevitability. Peter S. Goodman contributed reporting from London, Alison Smale from Vienna and Milan Schreuer from Paris. Long-term interest rates have risen sharply on his pledge to bolster the economy—but can he deliver? Markets are predicting that President-elect Donald Trump will be able to juice the economy soon after he gets in office. That is putting extra pressure on him to succeed quickly before higher rates quash any economic liftoff. Since the election, investors have embraced a view that the spending and tax-cut package Mr. Trump is promising will both boost growth and fan inflation. That has been good for stocks, but very bad for bonds, which have sold off sharply. The yield on the 10-year Treasury note is approaching 2.5%. Data Tuesday about rising labor costs coupled with last week’s 4.6% unemployment rate mean inflation, and yields, could rise further. Rising interest rates change the longstanding dynamic in the economy and markets. The higher yields go, the more costly it becomes for companies and households to borrow. The higher yields go, the stronger the dollar is likely to become, widening the trade deficit and weighing on the economy. And the higher yields go, the more attractive bonds become relative to stocks. If growth is accelerating, higher rates won’t matter to investors and businesses eager to cash in on the stronger economy. But if the Trump trade, which has already driven up 10-year Treasury yields by nearly a full percentage point, proves a mistake, or even just premature, higher rates and everything that comes with them could actually slow growth. A simulation that forecasting firm Macroeconomic Advisers ran for The Wall Street Journal shows what happens if Treasury yields rise further, not because of an improving economy but because investors believe, based on an incorrect growth forecast or for whatever reason, that the Federal Reserve will raise rates more aggressively. The firm’s econometric model, which incorporates hundreds of variables, is widely used on Wall Street and elsewhere to test economic scenarios. The starting point assumes that growth doesn’t pick up and current trends persist, with economic growth averaging about 2%, around where it is now, the unemployment rate keeps drifting lower, inflation firms and the Fed gradually raises rates. If 10-year Treasury yields rise by another half-a-percentage point, then the simulation predicts that annual economic growth by the first quarter of 2018 would fall to just 0.9%. That would push up unemployment, keep inflation lower than the Fed’s target and force the central bank to reverse course and lower rates. If yields rise a full percentage point, the outlook is so bad under this simulation that the Fed cuts rates down to zero. But if the Trump trade turns out to be right and the economy picks up, then the simulations show that yields could rise much further without hurting growth. Borrowing costs would go up, but so would the ability of companies and households to pay their debts, as sales and incomes rise. Companies that spent years selling long-term debt at low rates would benefit. The dollar might rise further, as overseas investors moved to take advantage of Treasurys’ higher returns. That would worsen the trade deficit, weighing on growth, as well as crimping the profits U.S. multinationals generate overseas. But that could be more than offset by a stronger domestic economy. The stock market would be able to handle the higher yields, as well. For years, the return that investors demand for holding stocks relative to the returns available on Treasurys—what is known as the equity-risk premium—has been unusually high, reflecting worries that the economy is stuck in a slow-growth, low-inflation environment. An improved economy would ease those worries, allowing stocks to absorb higher rates without falling. Mr. Trump has made a lot of big promises. If he fails to deliver quickly on the economy, his biggest promise might be a bust. In the aftermath of the November 8 election, no firm evidence has emerged that hacking interfered with voting machines or other electoral machinery. But in an election that turned on 100,000 votes in three key states, some observers argue that Russian cyber interference in the political process may have had a significant impact. Can such Russian behavior be deterred in the future? Deterrence always depends on who and what one is trying to deter. Ironically, deterring states from using force may be easier than deterring them from actions that do not rise to that level. The threat of a surprise attack such as a “cyber Pearl Harbor” has probably been exaggerated. Critical infrastructures such as electricity or communications are vulnerable, but major state actors are likely to be constrained by interdependence. And the United States has made clear that deterrence is not limited to cyber retaliation (though that is possible), but can target other sectors with any tools it chooses, ranging from naming and shaming and economic sanctions to nuclear weapons. The US and others, including Russia, have agreed that the laws of armed conflict apply in cyberspace. Whether a cyber operation is treated as an armed attack depends on its consequences, rather than on the instruments used. It would have to result in destruction of property or injury or death to individuals. But what about deterring operations that are not equivalent to an armed attack? There are gray areas in which important targets (say, a free political process) are not strategically vital in the same way as the electrical grid or the financial system. Destroying the latter could damage lives and property; interference with the former threatens deeply held political values. In 2015, a United Nations Group of Government Experts (including the US, Russia, China, and most states with significant cyber capabilities) agreed to a norm of not targeting civilian facilities in peacetime. This agreement was endorsed by the G20 countries at their summit in Turkey in November 2015. When an anonymous cyber attack interfered with the Ukrainian electric grid the following month, some analysts suspected the Russian government of using cyber weapons in its continuing hybrid warfare against Ukraine. If true, it would mean that Russia had violated the agreement it had just signed. But how should one interpret Russian behavior in regard to the American election? According to US officials, Russian intelligence agencies hacked into the email accounts of important Democratic Party officials and provided the materials to WikiLeaks to dribble out over the course of the campaign, thereby ensuring a continuous steam of news stories that were unfavorable to Hillary Clinton. This alleged Russian disruption of the Democratic presidential campaign fell into a gray area that could be interpreted as a propaganda response to Clinton’s 2010 proclamation of a “freedom agenda” for the Internet or retaliation for what Russian officials saw as her critical comments about Putin’s election in 2012. Whatever the motive, it looked like an effort to skew the US political process – precisely the type of nonlethal political threat that one would want to deter in the future. The Obama administration had previously made efforts to rank the seriousness of cyber attacks, but without sorting out the ambiguities of these gray areas. In 2016, Obama faced difficult choices in estimating the escalatory potential of responding with cyber measures or with a cross-sector response such as sanctions. The administration did not want to take steps that might themselves disrupt the election. So, eight days before the vote, the US sent Russia a warning about election meddling over a hotline – created three years earlier to deal with major cyber incidents – that connects the Nuclear Risk Reduction Centers in both countries. Because Russian hacking activity seemed to slow or halt, the Obama administration cited the warning as a successful exercise in deterrence. But some critics say the Russians had already achieved their main goals. Three weeks after the election, the administration said that it remained confident in the overall integrity of America’s electoral infrastructure, and that the election was free and fair from a cyber-security perspective. But intelligence officials continued to investigate the impact of a broader Russian information-warfare campaign, in which fake stories about Clinton appeared intended to influence voters. Many of the false reports originated from RT News and Sputnik, two state-funded Russian outlets. Should this be treated as traditional propaganda or something new? A number of critics believe that the level of official Russian state involvement in the 2016 US election process crossed a line and should not be dismissed as a form of tolerable gray-area behavior. These critics have urged the Obama administration to go further in naming and shaming, by providing a fuller public description of what US intelligence knows about Russia’s behavior, and by imposing financial and travel sanctions against high-level Russian officials who are identified. Other US officials, however, are reluctant to jeopardize the intelligence means used for attribution, and are wary of escalation. Russia’s involvement in the 2016 US election was a watershed. With important elections coming in a number of Western democracies, analysts will be watching closely to see what lessons the Kremlin draws from it.